Take an exciting and cozy ride across Canada with Via Rail. The crown-operated rail service offers travel by train to eight provinces, and you can also book hotel packages through their website. Get up to 25% off tickets and serious discounts on passes and packages using the sales and promo codes we list on this page! Take advantage of these daily deals and knock up to 60% off base fares. Start travelling today! Don't miss this Discount Tuesday sale to save on select routes in Economy and Sleeper class. No promo code needed.  Via Rail already has tons of offers available for train fairs, but you can also save another 10% when you create a free account. Travellers on the Montréal-Jonquière and Montréal-Senneterre trains can check their bike for free starting on May 1, 2019. Find Via Rail trips for as low as $26. It may be the furthest you've ever gotten for that price. On Tuesdays, you can save more at Via Rail. Check out the Discount Tuesdays section to see the best deals each week. Students can get unlimited travel for $469 at Via Rail with a travel pass. Looking for a deal on kids fare? All children between the ages of 2-11 get 50% off economy travel. Are you a student or a youth? You can save upwards of 20% off travel with this Via Rail student discount. Use your CAA membership and save 10% on best available fares at Via Rail. Looking for another way to travel across the country this year - check out the amazing offers found here at Via Rail. Book your Via Rail trip 3 weeks in advance for up to 24% off regular escape fares! Choose a different way to travel across Canada this year and grab your Canrailpass for as little as $296. It's a great way to travel and you'll get to see new parts of Canada! Check out these special offers on Sleeper Plus class deals at Via Rail - choose your destination and find an incredible deal. With the Via Rail app, you'll be able to keep your trips organized, buy tickets anywhere you are, and more! Join the Via Rail Preference program today and start earning points - get 1 points for every $1 you spend. Sign up to Wagjag.com email alerts and #SAVE away! Apply this Via Rail discount code to save 10% off base fares in Québec now. Want to bring the kids on a cool adventure this summer? Let them experience a new way to travel with Via Rail. Kids aged 2 to 11 travel for only $15! © Copyright 2019 Wagjag.com. All rights reserved.